The EU Leniency Policy offers a comprehensive description of the development of the policy, along with a normative framework that promises to ensure the full legitimacy of the leniency programme. To safeguard the legitimacy of the leniency programme, this book identifies that the European Commission’s policy should pursue not only effectiveness but also fairness. 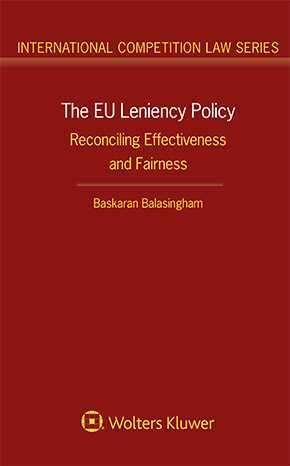 It is the first work to extensively analyse the effectiveness and fairness of the EU leniency policy. The book looks at why leniency is important and examines to what extent the current policy is effective and fair. The European Union (EU) leniency programme is a key weapon in the Commission’s fight against hard-core cartels which are the most harmful infringements in EU competition law. Much of the success of EU cartel enforcement depends on the continued effectiveness of the leniency policy and is especially critical in response to the growth of private enforcement. Looking back at the overall development since the inception of the first Leniency Notice, this book demonstrates that effectiveness and fairness have been successfully reconciled, and it has been updated to reflect the state of law as of 1 June 2017.
reforms brought about by the 2002 and 2006 Leniency Notices and the leniency-related amendments by the 2014 Antitrust Damages Directive. The theme throughout all chapters is the reconciliation of effectiveness and fairness. After setting the scene in Chapter 1 and clarifying the key concepts of ‘effectiveness’ and ‘fairness’ in Chapter 2, the subsequent chapters deal with the development of the EU leniency policy. A key feature is the author’s presentation of a normative framework to test the effectiveness (deterrence) and substantive fairness (retribution) of the EU leniency policy. As a clear demonstration of how to forestall the danger of focusing on the effectiveness of leniency at the expense of fairness, both in a substantive and in a procedural sense, this book is a major contribution to the literature of competition law. It will prove to be of great value to competition authorities, antitrust practitioners and interested academics not only in Europe but also throughout the world.